Independent journalist Garry Leech has spent the last eight years working in the most remote and dangerous regions of Colombia. Unlike other Western reporters, most of whom rarely leave Bogota, Leech learns the truth about conflicts and the U.S. war on drugs directly from the source: farmers, male and female guerrillas, union organizers, indigenous communities, and many others. Beyond Bogota is framed around the eleven hours that Leech was held captive by the FARC, Colombia’s largest leftist guerrilla group, in August 2006. Drawing on unprecedented access to soldiers, guerrillas, paramilitaries, and peasants in conflict zones and cocaine-producing areas, Leech’s documentary memoir is an epic tale of a journalist’s search for meaning in the midst of violence and poverty. This compelling account provides fresh insights into U.S. foreign policy, the role of the media, and the plight of everyday Colombians caught in the middle of a brutal war. 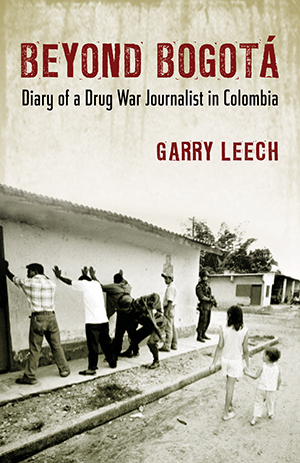 “That havoc within Colombia is portrayed with angry passion by the determined Garry Leech, that now rare beast in the jungle of journalism prepared to put his own life at the service of the truth. . . . A remarkable and captivating personal account of the drug war that unfolds mostly in Colombia. The idea for this book emerged during an eleven-hour detention I endured at the hands of Colombia’s largest guerrilla group in August 2006. More specifically, it evolved from thoughts that washed over me during that ordeal about my three-month-old son, Owen. I couldn’t stop thinking that if anything happened to me, either during that detention or at any other time in Colombia, I wouldn’t be around to explain to Owen, when he grew up, what sort of work his father did. Sure, he could read my articles and books and discover my views on U.S. policy in Colombia. But those writings do not explain how I conduct my work. They don’t describe the challenges and adventures involved in carrying out investigative journalism in Colombia’s remote rural conflict zones. And they don’t depict the moments of terror or those of inspiration that I have experienced in my encounters with Colombians from many walks of life. Most importantly, they don’t shed light on why I do this sort of work and the path that led me to become a drug war journalist. Consequently, Beyond Bogot? is the story of my work in Colombia--a sort of memoir, if you will. Naturally, my story cannot be separated from the larger drama in which the principal protagonists are Colombians who are living and dying every day in the midst of the country’s decades-old civil conflict. Colombia is the world’s leading producer and exporter of cocaine, and its illegal drug trade has fed the habits of drug users in the United States for more than three decades. As a result, we Americans are directly linked to Colombia’s violent drama, both through ever-rising levels of personal cocaine use and through the war on drugs that our government has been waging in this South American country. I have tried to place my personal story within the larger contexts of the U.S. war on drugs and Colombia’s civil conflict. I have drawn from my experiences working in various parts of Colombia over the past eight years in an attempt to portray, as comprehensively as possible, both my personal story and the struggles of those rural Colombians who are caught in the middle of the violence. There are not enough pages in this book for me to include all of the Colombians I have met or even to reflect on every region of the country in which I have worked. Therefore, I have selected those people and places that I hope will provide the reader with a relatively comprehensive portrayal of life in Colombia’s rural conflict zones. Woven throughout are accounts of the most profound and personal of my own experiences in Colombia. Sadly, for their own safety, I have had to change the names of some of the protagonists. I have not, however, altered the names of those Colombians who are already public figures or visible spokespersons for governments, organizations, communities, or armed groups. Ultimately, this book is an account of the U.S. war on drugs and Colombia’s civil conflict as seen through the eyes of a journalist. Colombia’s civil conflict and the war on drugs are complex issues, and I don’t for a moment pretend that I fully grasp all of their intricacies or that I have sufficiently addressed them x A note from the author in these pages. What I have tried to do is to recount my experiences and observations as accurately and honestly as possible. Beyond Bogot? is not a journalistic work, but rather the personal story of a journalist’s search for meaning in the midst of violence and poverty.